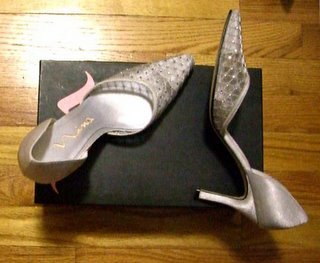 The shoe dilemma: finding nice shoes that would go with the wedding dress and the evening gown (asking for it to match the red Chinese dress too would be asking too much) and hopefully would go with other things so that I wouldn't wear it just once. I had been surfing on the shoe sites (zappos.com, myglassslipper.com -- they have an 'Under $100' section that I had read about, shoebuy.com) for silver shoes, staying away from the bridal shoes b/c I find most of them ugly and not very comfy-looking (not to mention they don't fit the criteria of being able to be worn more than once). I was also pretty sure that I'd want a wedge heel (more comfy) and a T-strap (slims wide feet like mine). I ordered 2 shoes from Zappos mainly b/c they received pretty good reviews but when I tried them on I realized that I have very difficult feet to work with (they were uncomfortable and one pair didn't fit at all). The shoes were also extremely poorly made. I can't believe that they cost over $50 b/c if they were in one of those ghetto stores that sell cheap clothes, I'd guess that they were $20 at most. One of them had a tacky clear plastic strap with beads glued on it and the other one had dried beads of glue oozing out of the undersole. Thank goodness Zappos has that free shipping free returns thing (maybe that's why the shoes were so expensive). I am impressed by how nicely wrapped up everything was (everything was tightly wrapped in tissue paper and taped) though. Then I went to Macy's this past Sunday (b/c it was tax-free week and to check out BM dresses). I saw a pair of silver T-strap sandals that looked kinda nice (even on my feet), with big jewels down the T-strap. While they were on sale for $60, I wasn't sure if I should get them since they didn't look too comfortable with the 3 (2.5?) inch heel and narrow front, which squeezed my toes together (the only thing keeping my feet from sliding down was the bone above my pinky toe so you can imagine the pain that would result from the rubbing as I walk). They weren't that uncomfortable for the minute or so that I had them on though. I left empty-handed. Throughout the week, I pondered whether or not I should go back and get them. I even went to the Nine West by work but they only had it in the bronze color. So I went back today determined to try on the shoes again and try to break them in and return them if they weren't comfy. This time, after wearing heels all day at work, the transition to the sandals wasn't as weird so it didn't feel unstable. But after walking a little and standing in them, I felt the balls of my feet hurt. Plus the back of the shoe was loose and looked weird no matter how tight I closed it. After much thought I decided to let these shoes go (even though they were the closest thing that I liked so far). I thought that I'd have to resign myself to wearing flats or sneakers on my wedding day (I still may do the sneaker thing at the banquet) and cursed my f'ugly feet for always giving me so much pain (3/4 of all shoes that I like I end up not buying or wearing b/c they are unbearably uncomfortable). Then I walked around a little and I saw a silver, pointy-toed shoe on the clearance rack. When I scanned it, it said $38 or so. After trying them on (they were pretty comfy compared to the boots I was wearing and the shoe that I had just tried on), I decided to buy them. The saleswoman was pretty nice (NOT the norm at Macy's shoe department, in my opinion) and noticed that the price was wrong b/c they should be 75% off. And instead of being $38, they were just $20! Woo hoo!! I wonder, am I supposed to wear hosiery with these shoes? They still need breaking-in, I'm sure. But at least I can go get my dress fitted for the right length now. Speaking of which, a friend recently asked her friend who used to be in the wedding gown business whether or not he'd be interested in helping me fix mine. He said yes! I don't mind going to Pinpoint and getting it all fixed up for about $450 (I even made an appointment for this Saturday) but if he can beat it and do a good job, I'd be even happier! This Friday I'm hoping to go to a tailor in Chinatown to see whether or not she can downsize the evening gown from a size 20 to a 4 for a good price (I've heard anecdotally that she charged only $7 to hem a four-layered dress). And Saturday we're supposed to meet with the photographer to work out last minute contract details and give him a deposit to secure him for the day. We've already turned down two photographers that we met with so this one better work out! Finally, progress!